You will be able to gather and record data and see it in real-time through the Science Journal an Android app from Google. The making and science activities written by the Exploratorium are geared for 10-14 year olds and utilize features of the Science Journal. 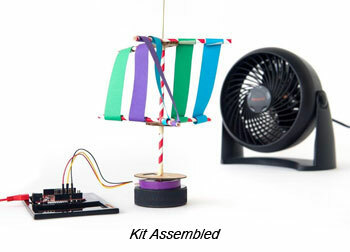 With the materials, electronics and activity guide, you will learn how to connect various sensors and play with materials to build electronic projects like a wind spinner and measure RPM using the Science Journal. 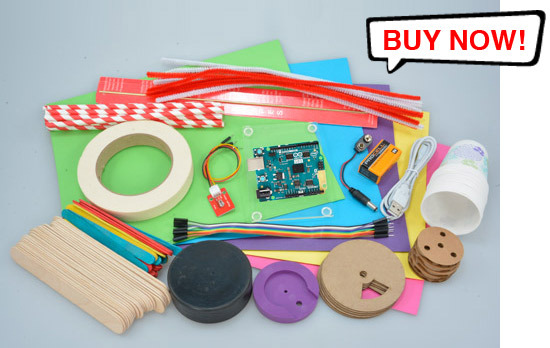 This kit is ideal for schools and museums, families at home and even experienced DIYers. Science Journal is a digital science notebook for Android devices. Collect notes, pictures, measure the environments and so much more! Intel Arduino 101 board has 196KB Flash Memory (recommended for those going beyond the supplied app and wish to expand on the program or write their own sketches). The 101 board also has a built-in 6-axis gyro sensor.